Pacific Low Island Environments is a book for those wanting to learn more about the places, plants, and animals on tropical low islands in the Pacific. Readers will learn how low islands are formed and the various environments that create habitats for many species of plants and animals. From atoll forests to patch reefs and the open ocean, readers will be connected to island life and how important these environments are for the communities that live there. Each page describes a different ecosystem in age-appropriate language and colorful graphics. Our Low Island Home also includes a word bank and teaching tips to support deeper learning. 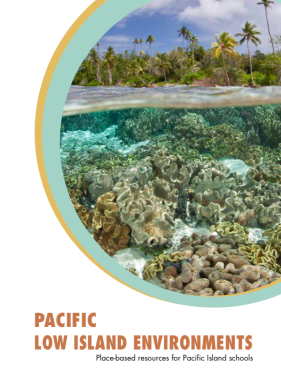 This book is part of the book series by PCEP, Place-Based Resources for Pacific Islands Schools.